Coffee prices have been falling over the past several months, thanks to an abundant supply of both Arabica and Robusta beans. But bumper crops cannot be counted on long term, since it only takes one big setback to decimate entire crops in agriculture. Setbacks could include drought, flood, insects or fungus, which is the case right now in Central America. 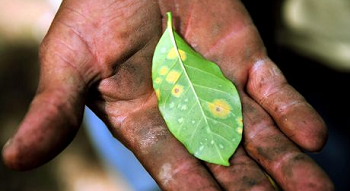 The fungus, known as coffee rust disease, is having a huge impact on arabica crops in most Central American countries and production is down as much as 20% this year. In countries like El Salvador, nearly 75% of plantations have been affected so far. The London-based International Coffee Organization reports that 70% of the crops in Guatemala have been impacted and over 60% in Costa Rica, so the impact in overall production could be even greater next year. This year, the problem is off-set by the bumper Arabica crops coming from South America, but the balance might not last long term, which could mean higher prices for consumers in only a short time.